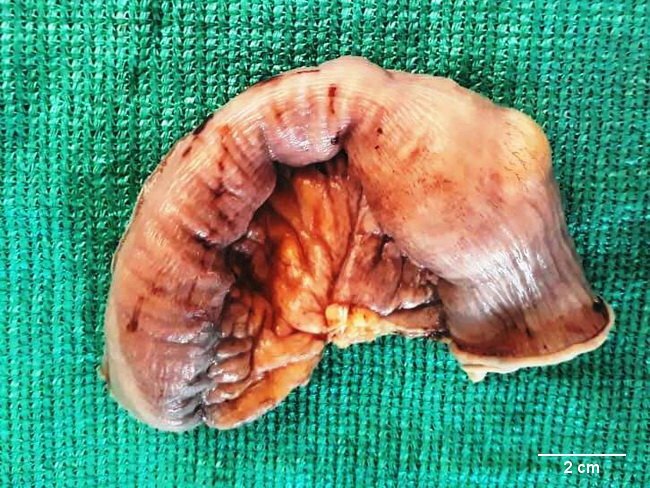 This specimen is from a middle-aged female who presented with acute abdominal pain and nausea. CT abdomen-pelvis showed ileo-ileal intussusception measuring 4.6 cm x 4.4 cm in size and a hypodense lesion on the leading edge measuring 2.4 cm x 2.8 cm in size. Emergency laparotomy was undertaken and the involved segment of small bowel was resected. The specimen measured 14 cm in length and showed bulging and distension (shown in this image) of about 4 cm diameter near one of the surgical margins. The bowel was opened longitudinally and showed a well-circumscribed sessile yellow tumor partially occluding the lumen (see next image). Microscopic examination confirmed it to be a lipoma. Intestinal lipoma presenting as intraluminal polyp is uncommon. Case courtesy of: Dr. Sanjay D. Deshmukh (Professor of Pathology) and Dr. Jayant M. Gadekar (Professor and Head of Surgery Dept. ), Dr. Vithalrao Vikhe Patil Foundation's Medical College & Hospitals, Ahmednagar, India.